Increase Battery Safety. Reduce Risks. The safety of consumers, collection sites, transporters, sorter and processors remains a top priority for Call2Recycle. To advance its commitment to safety, Call2Recycle is introducing its flame retardant box liner. This innovation offers an additional layer of protection in the prevention of a thermal event during the battery journey – from collection to transportation to sorting and processing. When used in conjunction with Call2Recycle’s program and regulatory terminal protection guidelines, the liner helps prevent flames escaping from the battery box in the event of a thermal runaway. 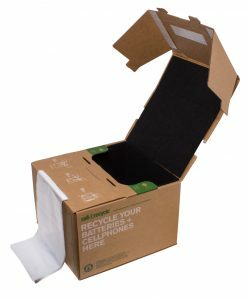 ✔ Reusable: liners will be removed at sorter and processor locations and reused in the distribution of new boxes. When quality has diminished, they will be recycled.